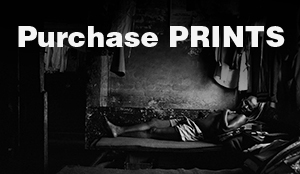 The renowned artist and photographer Omar Badsha’s latest book Seedtimes will be on sale in bookshops in January and available online (SAHO website). 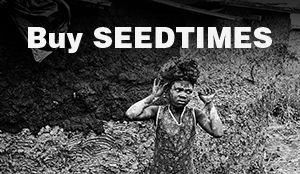 Seedtimes is the sixth book by the celebrated artist and award winning South African social documentary photographer. The opening image in this sequence is one of Badsha’s most formally powerful images: a child in the township of Inanda carrying a clump of wet earth on her head, which she is using to repair the outer wall of her home. The textural quality of the image in which the pattern on the young girl’s dress seems to merge her torso into the mud hut wall provides a backdrop from which she seems poised to spring forth, her hands held at a moment of anticipated action and her quizzical glance out of frame giving to the image a political narrative. The book begins with an extended sequence of photographs on children, a reminder that a formative project in Badsha’s career was the photographic essay and book ‘Letter to Farzanah’, a collaboration with Fatima Meer that marked the United Nations Year of the Child (1979). The photographic essay section closes with an image that has a pleasing lightness of touch, yet which prompts deeper reflection on the significance of this retrospective collection. The photograph invites the viewer to peer into the humble workspace of a watch repairer, a ‘Mechanic of Time’ as the sign above the entrance announces (Umkhandi Wama Washi in Zulu). One worker in the realm of time paying respect to another; the photographer whose task it is to stop time, looking in on a colleague committed to getting it going again. “The extended photographic essays that comprise the book are shaped by the overlapping concerns of community, political organisation, and the visual quality and material texture of the everyday. They emerge from a practice of attentive being and engaged looking; as Badsha describes it, ‘walk[ing] slowly, looking, framing, arranging and rearranging’. The photographs do not ‘capture’ the world unaware, as it were, but rather arise out of an ongoing dialogue; the photographer is participant as well as observer, and many of his subjects are collaborators in the image making. This is documentary, not in any narrow sense as mere record, but in its fullest, original sense as a creative.